Pasasalamat Sa�yo Ka-Rebisco ~ Philippine Freebies, Promos, Contests and MORE! For over 50 years, Rebisco has been part of every Filipino family. From your kids' everyday baon to our merienda and 'pantawid gutom'. As their way of saying "Thank You" to their loyal customers, they will be giving away lots and lots of prizes in their "Pasasalamat Sa'yo Ka-Rebisco" promo. 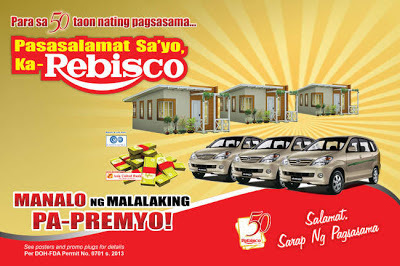 Buy any Rebisco Sandwich (Choco, Butter, Peanut Butter, Cream, or Strawberry) and Rebisco Crackers Plain with 50th logo. Together with your contact information in a piece of paper, enclose the wrappers in a legal sized white envelope and drop it in drop boxes located at any participating LBC Express branches and supermarkets nationwide. Huge prizes await you and your Suking Tindahan parter in the Grand Draw. For the First Prize, House & Lot (winner) and P100,000 (Suking Tindahan partner). Second Prize is Toyota Avanza (winner) and P50,000 (Suking Tindahan partner). And for the Third Prize, P500,000 (winner) and P25,000 (Suking Tindahan partner). There will also be 25 consolation prize winners of P5,000 worth of Rebisco products and P5,000 each for their Suking Tindahan partners. Promo Title: "Pasasalamat Sa'yo, Ka-Rebisco"